2019 - It's a Wrap! Another great weekend done and dusted. 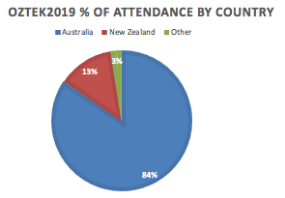 OZTek2019, once again, proved itself to be the premier dive show in the Oceania Region, covering all aspects of photography, travel and technical diving. In addition, freediving was included in the 2019 program. Because of noise in the hall, all speaking spaces were equipped with silent conferencing headphones, which from feedback received to date, were extremely successful and liked by delegates. OZTek is, and remains, a speaker-based event with over 50 speakers. The show endeavours to inspire divers to keep diving, to get involved; to encourage them to stay in the water, travel and train more, as well as discover and try new and exciting things. As always, OZTek is about quality over quantity - it’s about bringing our dive industry together and encouraging them to do more. Exhibitors feedback tells us overwhelmingly that quality of visitors was excellent. Conference delegate numbers were essentially static, slight increases in Silver one day and half day passes. I’m hoping these went to new divers testing the OZTek waters. Our Single speaker program was also popular - again, designed to provide new visitors with the opportunity to discover what really makes OZTek special; our speakers. Of course, one big difference this year was the inclusion of Richard Harris and Craig Challen, our Australians of the Year, brought their real-life rescue story to OZTek - for which we are extremely thankful. It was packed to overflowing and we had to stream the presentation into other theatres to ensure everyone was able to see and hear the presentation. They did not disappoint, barely a dry eye in the house - it was an extraordinary presentation and a real privilege to hear first hand. Again a big thank you to Richard and Craig for the support and generosity they provided to the Australian diving community through OZTek. Please note: I have not included the extra tickets of Thai Cave Only in the numbers - because not everyone who saw the Thai Cave presentation were divers and most who bought 'Thai only" tickets did not visit the exhibition. Lastly, whilst I loathe to even mention the weather, Sydney did experience massive storms that weekend; and the rain on Sunday morning was extraordinary. Speakers and delegates were diverted to other airports, luckily all made it to the show but it was generally agreed the weather did affect Sunday numbers. As a conference-based event dedicated to all underwater activities, and achievements, OZTek2019’s aim is to provide something for everyone: technical, history, physiology, wrecks, caves, photography … and inspire. With that goal in mind, we approached, and received the support of some of the world’s pre-eminent divers in their respective fields of diving expertise (motley crew pictured above!). At any one time during the course of the two-day symposium, there were up to five conference sessions/workshops running simultaneously. As far as was possible, we attempted to present presentations so people with specific diving interests could concentrate on those topics of particular appeal. The 2019 feedback has noted the range of speaker topics was excellent and of exemplary quality. And I sincerely thank all the speakers for creating such a dynamic and interesting environment. Especially thanks too, for embracing the new headsets - a new conference environment for us all. It does mean going forward, OZTek is not limited to the traditional theatre-style conference setting, and can now open up the possibility of other, potentially more adventurous, venues. In 2017 we introduced photography, with workshops and exhibitions. In 2019 we also included a full program of freediving topics - made possible by sponsors RAID International & Deeper Blue. As a toe dipping exercise, it was extremely successful and I encourage you to check out the OZTek YouTube Channel featuring the outstanding work of Dean Laffan and Adrian Davis (Real World) in producing some fun and inspiring OZTek TV videos. Plus Michael Menduno for his eclectic interviewing. With some surprising crossovers between diving and freediving, interest was apparent in the numbers - with scuba divers attending freediving sessions to learn more about this growing segment of the industry. As we move forward we will be bringing you some of the other 2019 presentations through audio, video and images. Massive thanks to Dean and Adrian for their work over the weekend. Complete stars. 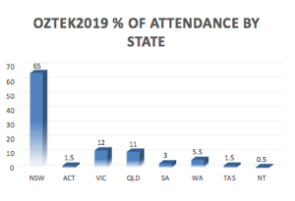 OZTek2019 saw a small increase in exhibitor space but again, some of the larger equipment manufacturers were missed - many visitors commented that they wished to see more equipment on display. However for those who did attend, overwhelmingly, the results have been positive, most stands reporting quality audience and excellent sales. The new session schedule changes have been overwhelmingly praised. The gap between each speaker session allowed delegates more time to move around and visit the stands. Also keeping all the main theatres in the hall, made it easy for delegates to smoothly move around the hall and not waste any time. The Australian Dive Marketplace was again welcomed by both participating stores and by manufacturers and distributors who all mentioned how good it was to have their stores on the show floor, especially as it enabled them to direct sales and traffic to their dealers. This space, also enables Australian dive stores to meet face-to-face prospective new customers and establish an immediate connection. 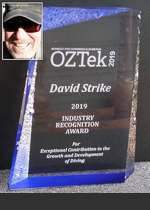 OZTek2019 ramped up the social media and, with the assistance of Richard and Craig and their extraordinary support, we saw a marked increase across Facebook, Twitter, Linked-In and Instagram. Plus an unusually high interest from mainstream media - something we’ve struggled to achieve in prior years. Outside of our diving industry media, an AAP journalist attended the show, details of the show went out on the ‘news wire’, Gettys Images took photos for release to interested media and we were mentioned on the Alan Jones radio show. We received favourable support from both domestic and overseas diving publications as well as on-line publicity via websites, diving forums and newsgroups and their own respective social media outlets. Thank you. Editorial mentions, articles, speaker interviews and promotional media releases appeared in a number of domestic and overseas publications while a series of Full Page advertisements also appeared in: Alert Diver; Guidelines (CDAA Magazine), Classic Diver (Historical Diving Society journal), Dive Log Australasia; Scuba Diver Asia Pacific, OZDIVER, X-ray Magazine, Deeper Blue and Ocean Geographic. Additional advertising banners and links to the OZTek2019 website appeared on diving-related internet outlets. A number of exhibitors also gave promotional support to the event by including both the OZTek2019 logo and links onto their own websites and incorporating information about the event in their regular email broadcasts to customers. In several instances those sites hosting discussion forums either created a dedicated OZTek category to help promote the event, or gave the event considerable positive support. The event was heavily promoted through the dive stores and we had a distinct increase in retail dive stores selling tickets and bringing divers to the show. Wonderful to see. In addition, subscribers registering their interest via the OZTeK website received newsletters, containing updates on the event. 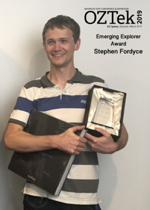 This year the OZTek2019 Underwater Photographic Competition underwent a significant re-vamp and became a primarily OCEANIA competition - with only one category open to international photographers. 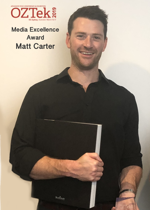 The aim is to provide a showcase for, and to encourage Australian and New Zealand photographers - I’m thrilled to report we had our highest entries ever with LOTS of new names, especially those entering a competition for the first time. Very exciting. 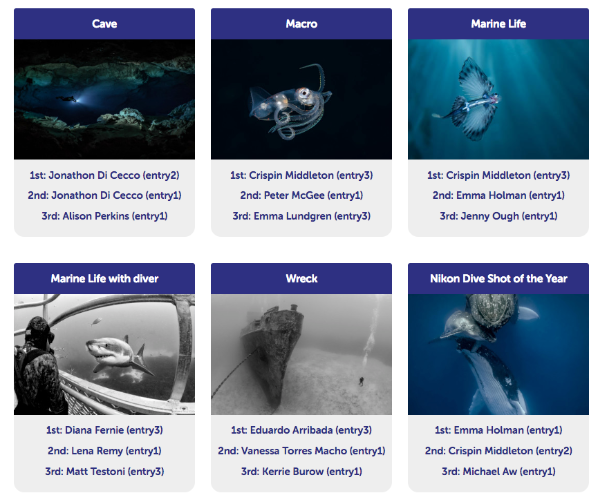 Winners were announced in the Scubapix Imaging Centre at OZTek and are now on the website. Congratulations to all entries, and, of course, the winners - some beautiful images. See them here. The Nikon Dive Shot of the Year had it's debut in conjunction with the Nikon Surf Shot of the Year and as always, created huge interest. Congratulations to all the winners. Nikon Dive Shot of the Year will be held annually with continued support from Nikon Australia. Many thanks too to Scubapix for their sponsorship, these things don’t happen without additional support and it is much appreciated. The competition was judged by a panel of experienced judges & photographers: Jayne Jenkins, Matty Smith, Chris Dalton and myself. Thank you everyone for your hard work. Scubapro G2 Computer, courtesy Scubapro. A sell-out affair, the OZTek2019 Gala Awards Dinner was held in the Lighthouse Gallery, Australian National Maritime Museum, Darling Harbour - a fitting grand finale to OZTek2019. Great fun, great people and a celebration of all that is good about diving. 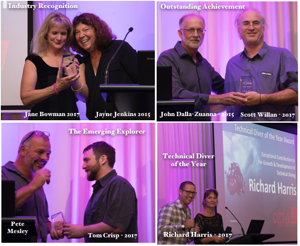 A few people were awarded on this night - those who are doing exciting things or who have gone above and beyond for the Diving Industry. Congratulations to all. All OZTek exhibitors, speakers, volunteers and visitors are valued partners and sponsors because, as corny as it sounds, OZTek would not be here without you ALL. Unique among diving events, with its conference knowledge-based format actively promoting the adventure and excitement of diving, and ever-growing dive, training, photography and travel show, OZTek encourages industry growth by focusing on diver retention and inspiration. We concentrate on delivering a clearly qualified audience passionate about diving – OZTek continues to evolve as a leading forum for enthusiastic divers keen to take their diving, training, photography and travel to the next level and who seek greater knowledge, and a better understanding of all the world of diving has to offer. I hope you enjoyed it - all feedback and good ideas welcome. Maintaining OZTek’s momentum OZTek2021 will be announced in coming months. In the interim, I would like to thank all of the exhibitors, speakers & sponsors for the magnificent level of support given to this year’s event. It was very much appreciated and I couldn’t do it without you. OZTek2019 is proud to announce Blancpain as a major partner and sponsor of the Gombessa Theatre within the OZTek2019 Advanced Diving Conference. Exploration and preservation of the world’s oceans is core to Blancpain. With its 66-year legacy of the Fifty Fathoms diving watch, Blancpain has become close to the explorers, photographers, scientists, and environmentalists who treasure this precious resource. With that affinity has come a determination to support important activities and initiatives dedicated to the oceans. For the past several years, the Blancpain Ocean Commitment (BOC) has been manifest through its support to oceanographic initiatives and partnerships with leading organisations, such as the Pristine Seas expeditions, Laurent Ballesta’s Gombessa project, the World Ocean Initiative organised by The Economist’s, and the World Oceans Day which takes place every year at the United Nations' headquarters in New York. We are trialling a new ticket scanning system at OZTek this year and are running a little later than expected sending out your eTickets. Your eTickets will arrive by email this week in plenty of time before the start of the Show. The attachment will include a barcode to bring with you to scan at Hall 5 reception, ICC Exhibition Centre, to enter. 9 Days to go ... Are you READY? JUST OVER ONE WEEK to the the biggest Dive show in Australia ... EXCITED YET? So much to choose ... which presentations to see, including the First Australian public talk by our Australians of the Year, Richard Harris & Craig Challen on the Thai Cave Rescue? New gear to check ... discovering new travel destinations, photography and video techniques & equipment? Perhaps try your first Cave Dive! 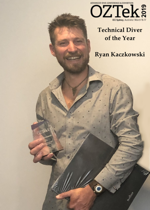 Or checkout all the winning images from the OZTek 2019 Underwater Photographic Competition - including the 2019 Nikon Dive Shot of the Year. 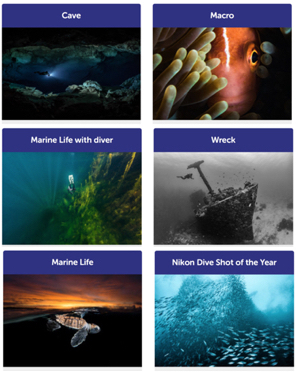 OZTek2019 Underwater Photographic Competition Entries - including the 2019 Nikon Dive Shot of the Year - are now up on the website. Reserve your ticket now, avoid the queue AND go into the draw to win a fabulous Philippines holiday with Atlantis Dive Resorts & Liveaboards! OZTek Gala Dinner - Don't Miss Out! If you haven't already booked your seat... best hop to it! The OZTek Gala Dinner is a fitting finale to an action-packed weekend devoted to the excitement & adventure of diving. It polishes off, in grand style, at the Lighthouse Gallery, ANMM on Sunday March 17, 2019 @ 7.30pm. We've something a little different to surprise everyone this year, as well as the usual magnificent food & wines!